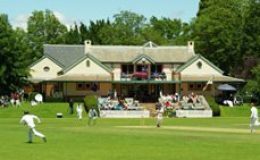 Purchase an Admission Ticket | The International Cricket Hall of Fame. Save time by purchasing your ticket to the Bradman Museum and International Cricket Hall of Fame online. The International Cricket Hall of Fame is open everyday from 10am – 5pm, except Good Friday and Christmas Day. You’ll find us in St Jude Street, Bowral, just off the F5 Freeway (Hume Hwy), about half-way between Sydney & Canberra. You should allow at least one hour to visit through The International Cricket Hall of Fame. Whether you are a cricket tragic, or simply interested in learning more about one of the world’s most popular sports, the Bradman Museum and International Cricket Hall of Fame provides an exciting and educational day out for the whole family. Located less than ninety minutes from both Sydney and Canberra, in Sir Donald Bradman’s home town of Bowral, this new attraction incorporates innovative and interactive displays that will engage and inform you. Live footage from around the world, touch screen interactives and fascinating memorabilia are just a few of the exhibits that will keep you entertained for hours. The Bradman Museum and International Cricket Hall of Fame is set in the beautiful surrounds of Bradman Oval, and includes the Bradman Café and gift store in the complex. While we recommend that you will need at least one hour to go through the museum, you could spend all day here. Our complex includes a café and a gift shop, and we’re located right next to the stunning Bradman Oval and Pavilion. Plus, Bowral’s boutiques and art galleries are only a couple of streets away. 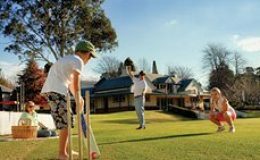 Bradman Oval is the spiritual home of Sir Donald Bradman, but that doesn’t mean you can’t stroll around the perfectly manicured outfield or even bowl a couple of overs at the nets. A children’s playground is right next door, with plenty of trees under which you can rest and revive before coming back in to experience more of The International Cricket Hall of Fame. Gone are the days of looking at static displays in glass cases. 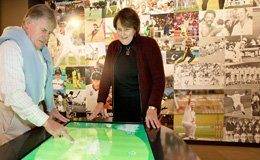 At The International Cricket Hall of Fame you can test out game strategies on an interactive table, view on-demand videos from the greats of the game and learn more about players and spectators through touch-screens. 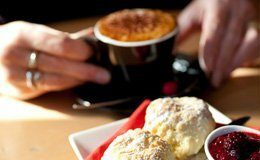 Whether you want a quick coffee and cake, or a relaxing lunch, Bradman café offers inside dining for those crisp Highland winter days, or outside tables so you can enjoy the warmer weather.